Virtuoso oud player, serial collaborator, musical explorer: Khyam Allami is a musician and composer with a formidable international reputation. 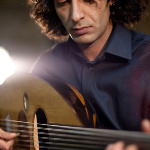 Virtuoso oud player, serial collaborator, musical explorer: Khyam Allami is a musician and composer with a formidable – and continually growing – international reputation. Despite only taking up the oud – his principal instrument – in his twenties, Allami rapidly became a performer of international renown. His remarkably assured 2011 debut solo album Resonance/Dissonance was widely critically praised; he has performed at WOMAD, the BBC Proms and London 2012 Festival, the cultural festival that accompanied the Olympics; and he was the first artist to be awarded a BBC Radio 3 World Routes scholarship in 2010. Khyam Allami was born in 1981 in Damascus to Iraqi parents, and he moved with his family to London in 1990. After his first musical experience with the violin as a child (he played the role of a young violinist in Syrian art-house film Al-Tahaleb before leaving for the UK), Allami took to rock music in his teens, playing bass guitar and drums in bands and developing a reputation as a creative and hard-hitting drummer. Yet something was missing in Allami’s musical life and in a complete break from his previous path, he began to study the oud, Iraqi music and Arabic music theory with London-based Iraqi maestro Ehsan Emam in 2004. An intense period of learning followed. Over several years Allami travelled throughout the Middle East, studying with oud masters Naseer Shamma and Hazem Shaheen in Cairo, and Mehmet Bitmez in Istanbul, and completed two degrees in Ethnomusicology at the School of Oriental and African Studies (SOAS), University of London, where he has since taken up a teaching position. Allami’s breakthrough as a performer came in 2010 when he was awarded the inaugural World Routes Academy scholarship, BBC Radio 3’s mentoring programme. The scheme led to a string of exciting projects, from co-producing radio programmes with legendary presenter Lucy Duran and interviewing musicians, to collaborating with a cast of Arab musicians throughout a three-week trip to Beirut. The scholarship culminated with two spectacular performances at WOMAD and the Royal Albert Hall (BBC Proms) with Italian master percussionist Andrea Piccioni. Perhaps Allami’s taste for developing collaborations was cemented in this period. He has gone on to develop the oud and percussion ensemble Double Duo with Ahmad Al-Khatib, Youssef Hbeisch and Andrea Piccioni, write new music for the Royal Shakespeare Company, tour with the National Youth Orchestra of Iraq and, most recently, create the Alif Ensemble with Tamer Abu Ghazaleh and Maurice Louca. The pan-Arabic band debuted in the UK as part of the Liverpool Arabic Arts Festival and London 2012 Festival, and its contemporary take on Arabic music rocked the BT River of Music Festival Asia Stage in London ahead of the 2012 Olympics. Allami also performed with Blur at the sold-out Olympics’ closing celebrations Hyde Park in front of an 80,000-plus audience, following a tour with the British band. Allami continues to perform as a drummer too, most notably with Tamer Abu Ghazaleh, one of the most respected and exciting musicians on the alternative Arabic music scene. Ironically for a musician with such a flair for building musical relationships, Khyam Allami’s debut album in 2011 was a solo record of oud music, an ambitiously conceived and boldly delivered set of compositions and composed-improvisations. Resonance/Dissonance communicated the spirit behind Allami’s playing, his interweaving melodies and rhythmic flourishes respecting traditional forms and structures while always hinting at an elsewhere slowly being discovered. It also crystallised Allami’s developing musical philosophy, dually based on communion with his audience and making new music while referencing long-held traditions. His restless search for meaning in music was deeply expressed on the album and the music press recognised its quality. Songlines magazine, whose readers nominated the record for its 2012 Music Awards, called Allami an “exceptionally refined and graceful performer” whose “compositions are utterly bewitching”.